Obsidio is the final instalment in the Illuminae Files trilogy and therefore this review may contain spoilers for the previous books. Well the Illuminae Files have been quite a treat, I don’t know why I took so long to start but I have now devoured the entire trilogy. I loved all three books although Gemina was probably the weakest. Rather than following the same formula, Obsidio sees are intrepid characters find a way home… The only way to return to Kerenza where a mobile jump gate is located. As well as BeiTech forces, occupying the illegal mining colony. There is a new pair of characters introduced, but this time they are planetside. Asha Grant is Kady’s cousin and she’s been surviving day by day, thinking her entire family is dead. Trained as a pharmacy tech, her skills are in demand and she must treat the men and women responsible for so many deaths. Little does she know, her ex-boyfriend has been onboard BeiTech’s Magellan jump gate and is about to be sent to the surface. 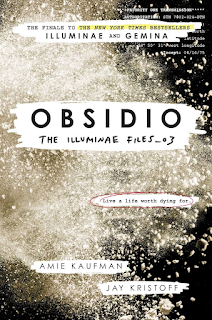 What Obsidio does that the other books don’t is portray the enemy as more human, the lines become more blurred. There are people just doing their jobs, maybe without the full knowledge of what is going on. Soldiers who are told they are managing a criminal outpost versus the people left behind on Kerenza, their friends and families killed, missing or taken hostage. What happened here on Kerenza is not the story of one corporation against another. It is the story of what happened to those caught in the middle. On the other hand, war crimes have been committed. It’s not like at any point you think BeiTech are innocent, but maybe not everyone working for them is evil. There are some pretty upsetting scenes, even more when you realise they have been taken from Earth’s history. And Oh AIDAN. I just can't even. He had some amazingly moving scenes. I think with all the work on driverless cars, we can start to see where AI needs to be very very careful in assessing situations involving human life. Would you kill 1000 to save 1001? Who is more important to save? My systems still have D-D-Difficulty inteRpReting ceRtain human manneRisms. If you coulD avoiD speech moDes involving false ambivalence anD iRony, that woulD DecRease the Risk of teRminal failuRe of my synaptic netwoRk. The whole trilogy is so gripping and I read most of the final instalment in one day. I cried, a lot. I’m so happy to hear Jay Kristoff and Amie Kaufman are working together on a new series, not in this universe but still multiple perspective science-fiction.